Home »Boundaries » You can’t tell by looking at me ……. You can’t tell by looking at me ……. We all wear masks. They consist of the parts of ourselves that we gladly show to others – qualities, attributes, feelings, and experiences that we choose to reveal in a given setting. We also have parts of ourselves that we don’t talk about or show. Maybe because nobody asks. Or maybe because we don’t want others to see or know those parts – the parts of us that are vulnerable, sad, angry, broken, tender, imperfect, or just private. Maybe we don’t feel safe. Some of us are more comfortable showing vulnerability, some less. There is nothing inherently wrong with having a mask – in fact, it is entirely appropriate to filter differently for workplace colleagues than for family or close friends. 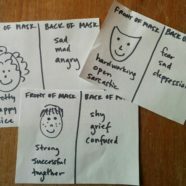 However, our masking becomes a problem when our life fails to provide any space where it is psychologically safe to reveal more of ourselves and to seek connection, comfort, guidance or help. Ashanti Branch is on a mission is to provide boys and girls in Oakland with a safe space to lower their masks and thereby learn to be aware of, acknowledge and express some of the pain, fear, anger and trauma that they have learned to bottle up. Ashanti is a teacher and founder of the Ever Forward Club, a non-profit organization dedicated to helping kids graduate high school and go on to college. I was lucky enough to spend a couple of hours with him last week when he came and conducted a workshop with a roomful of coaches. He put us through some of the same exercises that he uses with his kids, and it was a powerful and humbling experience. The exercise was simple: on one side of a card, we drew a picture and wrote 3 words or descriptions of things we gladly show, and on the other we wrote 3 words or descriptions of things we don’t generally share. Then we mixed up all the cards and went around and each read one word from the front: confident, warm, happy, strong, smart, open. Then we went around and read words from the back: worried, anxious, angry, lost, terrified. Ashanti showed us the cards of teenage boys from Oakland, and they looked remarkably similar to ours. Even among coaches who have done lots of personal development work and cultivated the skill of self-exploration and awareness, we keep a lot hidden. Then we broke into small groups and shared. To me, it felt scary but good to peel back the mask and receive acceptance and to support my colleagues in revealing themselves. I imagine it means even more to those boys and girls in Ever Forward, particularly those whose masks conceal significant trauma. You can’t tell by looking at someone what experience, pain, or loss lies behind his or her facade. If we did know what was behind someone’s mask, how might it change our response to him or her? If we knew that our cranky co-worker lived in chronic pain, or that the smarmy customer service rep was worried about paying his bills this month or had a parent with dementia, or that our uptight boss has an adult autistic sibling whom he cares for at home, or that our underperforming employee is grieving a miscarriage? How might the stories we tell ourselves about who they are change? Could we find more compassion and less judgment? Get less annoyed at or hurt by their behavior, maybe even appreciate their strength? What if we just consider the possibility that there are pains and joys and depths we don’t know in everyone we meet? Ashanti’s work is featured in “The Mask You Live In,” Jennifer Siebel Newsom’s powerful documentary about how our culture teaches boys to suppress their tender emotions and “Man Up.” The toxic reaction to the recent controversial Gillette short film, “We Believe: The Best Men Can Be” underlines the need for us all to continue to strive to create safety in which others can be their full selves, and for all of us to practice compassion rather than judgment in the face of other people’s masks. You can join his 100k Masks project and help him collect 100,000 masks from all over the world.